There is no general right for funding for participation in an inquest, but section 6(8) of the Access to Justice Act 1999 allows the Lord Chancellor to authorise funding in “specific circumstances“. The Lord Chancellor’s guidance on the Act provides that when granting funding, the Legal Services Commission (which handles funding requests), should be satisfied that “[t]here is a significant wider public interest” and “Funded representation for the family of the deceased is likely to be necessary to enable the coroner to carry out an effective investigation into the death, as required by Article 2 of ECHR“. Article 2 of the European Convention of Human Rights, the right to life, plays in important role in coroners’ inquests, as it places the state under an obligation not just to prevent deaths but also to investigate deaths that have occurred, in order to stop them happening again. This is often referred to in the investigative obligation, and it can extend to funding legal representation for the family members of those who have died to take part in inquests. This principle was demonstrated recently in the case of Humberstone, R (on the application of) v Legal Services Commission, where legal aid was eventually granted to the mother of a child who had died in hospital (see our post and a wider discussion on legal aid at inquests). However, unlike Mrs Humberstone, Ms Patel’s judicial review attempt was rejected. The High Court began by emphasising that it considered the words “significant wider public interest” gave the Lord Chancellor a wide discretion. The threshold “is high because of the need for there to be not merely a potential of the proceedings to produce real benefits for individuals other than the client… but that the benefits must be substantial”. The application for funding was also put firmly in the context that the families of the 7/7 victims would all be represented at the coming hearing. Ultimately, the court found that the Lord Chancellor was “quite entitled” to conclude that there was no evidence of “real benefits for individuals other than the client… let alone that any such benefits would be substantial”. Far from providing any information that might assist the wider public interest, she has flatly and unequivocally declined the opportunity to do so. … this inquest has its own substantial legal team, led by Mr Hugo Keith QC. There is no reason that we can discern why the interests of the claimant, on the basis of the information before us, cannot be fully and properly dealt with by her giving a statement of the background of her late husband and others to the legal team acting for the Coroner, on the basis of which the experienced counsel acting for her could ask the requisite questions. This decision seems fair, given that the Claimant could not demonstrate how she could add much to the inquest proceedings. 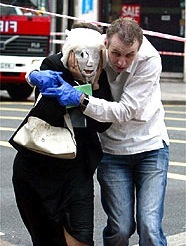 The decision will also be a popular one, given how little public sympathy there is for the families of the 7/7 bombers. However, it would not be too difficult to imagine a scenario where the relative of a suicide bomber could justify such funding. The 7/7 inquest is going to be wide-ranging in its scope, and it is legitimate and important, as the High Court pointed out, to ask how the British-born bombers became ‘radicalized’. But this may be best accomplished by calling the bombers’ relatives as witnesses rather than providing them with legal representation.